Are you dreaming of a perfect smile but have chipped teeth, discolored teeth, significant gaps in between the teeth or another dental issue? Improve your smile and confidence with veneers applied by a cosmetic dentist. Veneers can reshape and even out the teeth, fill in the gaps and give a beautiful, pearly white smile to show off. Not only do they enhance a smile, but they also protect teeth. Porcelain veneers, otherwise known as traditional veneers, started as a temporary solution to improve the smiles of actors in the late 1930s. These veneers are a thin ceramic shell bonded to the front side of the teeth. This method is a popular and permanent solution to undesired smiles. Porcelain veneers can last for at least ten years. With the right dentist and dental care maintenance, they can even last over 20 years. Lumineers are the strongest and thinnest dental veneer; these veneers are about as thick as a contact lens. Applying Lumineers requires no grinding and is pain-free for the patient. It takes about two dentist visits to apply Lumineers. They will last for over 20 years and are completely reversible if desired. Composite veneers, also known as bonded veneers, are a less expensive and less destructive way to modify a smile. The dentist applies the veneers in one visit. Bonded veneers last around five to ten years and make a perfect smile with composite material covering the front teeth. These veneers are polished and smoothed to accomplish the look of natural teeth. Composite veneers will help achieve that dream smile but can be prone to chipping and staining more than porcelain veneers. Though this is a significant disadvantage in a way, bonded veneers can be quickly repaired. Palatal veneers are generally constructed out of gold, but a candidate can also order a veneer from a manufacturer out of porcelain or composite materials. These veneers are explicitly created for treatment and management of tooth wear and are applied to the inside of the upper teeth. Non-permanent veneers can be removed as needed and are usually used before the placement of porcelain veneers or when a candidate wants veneers. Non-permanent veneers are made from a flexible type of plastic or resin material. There are even kits that can be purchased to apply non-permanent veneers at home. 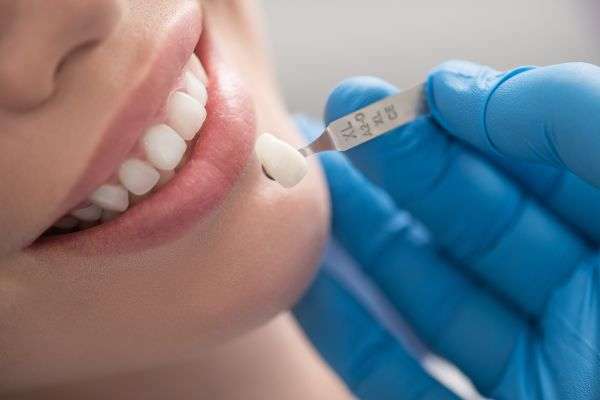 Whether you want to improve a smile with porcelain veneers or bonded veneers, a cosmetic dentistry service will help you achieve the smile you've always dreamed of. Improve your smile and gain new-found confidence with a veneer treatment. Are you considering cosmetic dentistry in the Livermore area? Get more cosmetic dentistry information at https://www.drtimhubbs.com.